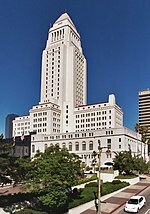 The 1969 election for Mayor of Los Angeles took place on April 1, 1969, with a run-off election on May 27, 1969. Incumbent Sam Yorty was re-elected. ^ "Los Angeles Mayor - Primary". Our Campaigns. ^ a b Officially all candidates are non-partisan. This page was last edited on 3 April 2019, at 08:37 (UTC).